Jesus died at the three o’clock hour. This is known in the bible as “the ninth hour.” It was for this hour that Jesus had come into the world. In the beginning of His Passion, in the garden of Gethsemane, Jesus prayed to the Father, in agony and sweating blood, with foreknowledge of His coming torture and death, saying “Now My soul is troubled. And what should I say—‘Father, save Me from this hour’? No, it is for this reason that I have come to this hour.” (Jn. 12:27) As the Catechism states “..for His redemptive passion was the very reason for His Incarnation.” (CCC 607) The Word of God became flesh and suffered and died as an expiation for our sins, in order to reconcile humanity with God. (CCC 457) St.John reinforces this point by declaring that the Father “sent His Son to be the atoning sacrifice for our sins.” (1 Jn.4:10) This atoning sacrifice, the Passion and death of the Son of God, was accomplished at the ninth hour, or at three o’clock, on a Friday afternoon. As the Scripture tells us, “And Jesus cried again with a loud voice and yielded up His spirit.” (Mt. 27:50) Jesus’ willing sacrificial death freed us from our sins and gave the possibility of conquering death and resurrecting us to eternal life. At the three o’clock hour, in the midst of His Passion, Jesus, the only Son of the Father, took on the sins of the whole world, in order to free us from our sins. As St.Paul tells the Corinthians, “For our sake He made Him to be sin Who knew no sin, so that in Him we might become the righteousness of God.” (2 Cor. 5:21) During the original Passover of the Israelites in Egypt, they offered the sacrifice of a one year old lamb “without blemish” (Ex.12:5), putting its blood on their house doorpost, so that the angel of death would “pass over” them, and keep them from dying. Later, in the Temple period, under the Mosaic law, the Temple priests sacrificed two lambs a day in expiation for the sins of the people. (Ex.29:38-39) So, now too, Jesus, as He went into His Passion and Crucifixion, was “like a lamb led to the slaughter or a sheep before the shearers, He was silent and opened not His mouth.” (Is. 53:7) The Old Mosaic lamb sacrifices were merely symbolic representations, typologies, to prepare the Jews for the one true sacrifice of the Son of God. Jesus is the true lamb of God. This is why, upon first seeing Jesus, John the Baptist declares, “Behold, the Lamb of God, Who takes away the sin of the world!” (Jn. 1:29) Jesus took on our sins and became sin on the Cross, for the sake of our eternal well-being. The three o’clock hour is a privileged moment in the day for us, to claim mercy for the salvation of sinners, and the whole world, by virtue of Jesus’ passion, suffering and death. We can be there with Mary and St.John at the foot of the Cross. As Jesus implores us, we can, even “for a very brief instant,” at the three o’clock hour, immerse ourselves in prayer to Jesus, calling upon His divine mercy, in intercession for others. We can make a short prayer each and every day at 3:00, despite our busy days and schedules, whether at work, or at home, or in the car, or whatever we might happen to be doing at that moment. It is very easy to make this a part of our daily schedule. After a while, it will become second nature to us, pausing for a moment in our daily routines, to worship the divine mercy of Jesus and ask for intercession of behalf of the salvation of sinners. A brief prayer at the three o’clock hour should be a part of our prayer life, each and every day. 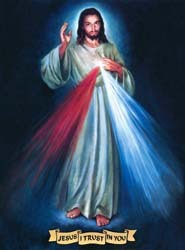 In this way, we can trust in Jesus’ divine mercy for the salvation of our souls. This entry was posted in Three O'Clock Hour and tagged 3:00 hour, Amos, Crucifixion, divine mercy, hour of divine mercy, Jesus, lamb of God, Passion, passover, prayer, Psalm 22, Saint Faustina, salvation, sinners, St.Faustina, three o'clock on January 27, 2016 by Brian.